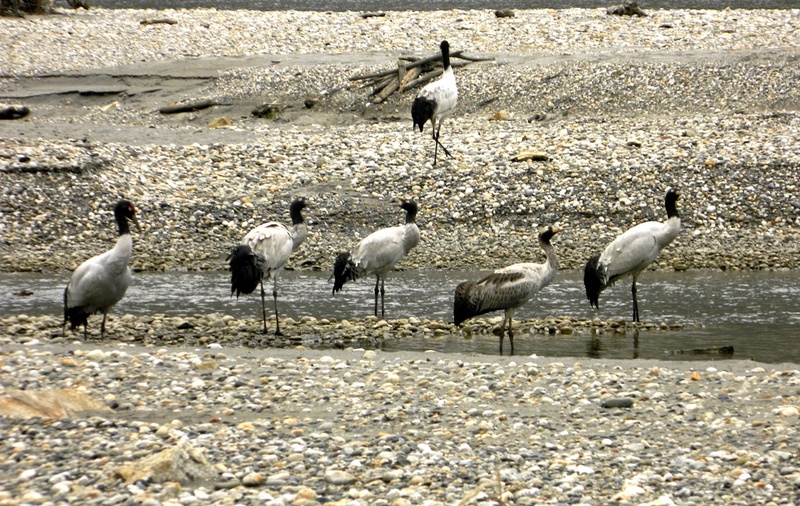 Arunachal Pradesh is excited about hosting the sacred black-necked crane that has started arriving once again in its wintering abode in the Pangcheng valley along the Nyamjang Chhu River in Tawang on Monday. As two cranes landed at Zemithang, locals, who consider the sacred bird as an embodiment of the sixth Dalai Lama, rejoiced at their auspicious arrival, reports The Arunachal Times. The sixth Dalai Lama, His Holiness Gyalwa Tsangyang Gyatso, born in the Monpa community in Tawang in 1683, has written about the majestic bird in one of his famous poetries. A short three-km stretch of the Nyamjang Chhu River between Brokenthang and Zemithang in Tawang district of Arunachal Pradesh is one of the only two regular, long-term wintering sites of the bird in India currently. The other site is Sangti valley in West Kameng district of Arunachal Pradesh. The bird is protected under Schedule-I of the Wildlife (Protection) Act, 1972 and is in the ‘vulnerable category’ as per the IUCN. Although the birds were seen in the Chug valley in 2016, it is yet to be confirmed as a regular wintering site over a longer period of time. Although the birds have been coming to the site since time immemorial, their arrival has been documented by conservation organization, WWF – India, in collaboration with local villagers for the past 10 years in a row, with the exception of last year. Rajiv Gandhi University’s Ecology & Wildlife Biology (Department of Zoology), Assistant Professor Dr Daniel Mize has also been keenly following the wintering of the iconic bird for the past few years and writing about it in this paper. This year, the arrival of the bird has already been documented photographically by a local teacher Degin Dorjee on Monday. Although the proposed dam was the primary threat to the black-necked crane’s wintering habitat at Zemithang, other relatively smaller but critical threats also need to be urgently addressed, such as the sand mining. Last year, the cranes could not land due to local disturbances due to various factors, including blasting for road construction.